But work it did. The original site on the Kawarau Bridge has spawned imitators, not just in Central Otago, but all over New Zealand. Since it opened in November 1988, tens of thousands of people have paid $NZ180 (£90) for little more than a commemorative t-shirt, an adrenaline rush and soiled underwear. Bungee jumping wasn’t the only business to arouse local derision at the time. Just after Rob Hay bought the spectacular site that was to become Chard Farm, coincidentally opposite the Kawarau Bridge, he overheard some sheep farmers talking about “those grapeys” in the Royal Oak Hotel in Queenstown. “Waste of bloody good merino country, if you ask me,” said one of them. It is remarkable how much Central has achieved in a short time, especially given its shaky beginnings. The first winery was created by a French “gold miner and agriculturalist” called Jean Désiré Feraud as long ago as 1864, but that was an aberration. The modern wine “industry” is much more recent, dating back to the mid-1970s, when a few experimental vineyards were planted. Ann Pinckney’s initial release from Taramea in 1985 was the first commercial Central wine since the 1860s. As history has demonstrated, the pioneers were right, the experts wrong. Central has grown from tiny beginnings to become one of the most exciting wine regions in the southern hemisphere, particularly for Pinot Noir. Statistically, it is comparatively small with only 1,543ha of New Zealand’s 33,600 ha of vineyards, but it makes a disproportionate amount of noise for its size. 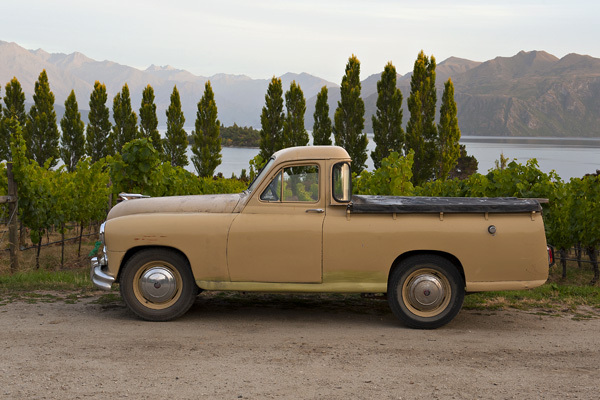 Isolated it may be, but Central Otago and its winemakers know how to create a buzz. The first thing to be said about Central is that it is outrageously, almost eye-poppingly beautiful. New Zealand is not short of spectacular landscapes, but this is surely its most dramatic: a region of snow-crenellated mountains, clear blue lakes, jagged-sided gorges and tumultuous, fast-moving rivers. Little wonder it attracts so many tourists, or that The Lord of the Rings was filmed here. Despite its southerly latitude, Central succeeds for a number of reasons. First, it is the driest region in New Zealand with between 350mm and 450mm of rain (compared with a forget-about-your-hosepipe-bans 9 metres on the west coast). Of the major Pinot Noir growing regions, only Chile is drier. Secondly, it is inland and protected from the worst of New Zealand’s weather by the Southern Alps. The region has a semi-continental climate, with low humidity and less disease pressure than wetter areas. Central has warm, even hot summers and very cold winters, with significant diurnal variation during the growing season. Famously, Central has high levels of UV light (40% greater than you’d expect for its latitude). Is this because of depleted ozone levels or because the air is so clean? Whatever the answer, it helps to explain the deep colour of many Central Pinots, as the grape skins thicken in response. The vines here get more than enough sunlight for photosynthesis, but grapes ripen later than in most Pinot Noir-producing regions. The period between flowering and harvest is two weeks longer in Central than in Oregon or Burgundy. For all that, there are six identifiable sub-regions. Gibbston, the closest to Queenstown, is the coolest and highest. It can produce fantastic wines, albeit in an elegant style, but suffers from vintage variation: in some years, flowering doesn’t take place until after Christmas. As a result, the number of wineries using unblended Gibbston fruit is comparatively small: Coal Pit, Wild Irishman, Valli, Hawkshead, Brennan, Two Paddocks, Gibbston Valley, Mount Rosa and Georgetown Vineyard. Others with vineyards and wineries here, such as Peregerine, Chard Farm and Mount Edward, prefer the security of regional blends. Wanaka to the north is the smallest of the sub-regions and is slightly warmer than Gibbston, with vineyards situated around the much-photographed lake of the same name. Rippon and Maude are the best-known names here. Further south, Alexandra is also considered a cool area, although it is much warmer than Gibbston during the day and cooler at night. Dean Shaw of the Central Otago Wine Company describes the resulting wines as “more feminine” than the “gruffer” Gibbston style. Alex, as it is known, is not without its problems, being exposed and affected by southerly winds. Producers to look out for include Two Paddocks, owned by the actor Sam Neill, Three Miners and Grasshopper Rock. The Cromwell Basin is the engine room of the Central wine industry. The pioneers may have started in Wanaka, Gibbston and Alexandra, but the proximity of Lake Dunstan and Cromwell’s location further inland offers better protection against frost and means it can pick a full three weeks ahead of Gibbston. Bannockburn is the most familiar sub-region in the Cromwell Basin, partly because of the success of Felton Road. This north-facing bowl lies on the southern bank of the Kawarau River at the foot of the Cromwell Basin and is warm by local standards; it was dubbed the “heart of the desert” by the miners who came to the region to prospect for gold in the 1860s. Even though it is treated as a single area, Bannockburn has two very different terroirs: sand close to Cairnmuir Road in the east and schist and clay to the west around Domain and Felton Roads. This is the most heavily planted of the sub-regions, producing grapes for brands such as Mount Difficulty, Felton Road, Olssens (Terra Sancta), Carrick and Wild Earth. It is also the home of the Calvert Vineyard, which sells grapes to three of New Zealand’s best Pinot producers: Felton Road, Pyramid Valley (from North Canterbury) and Craggy Range (from Hawkes Bay). The differences between the three wines are fascinating. The two remaining Cromwell Basin sub-regions, Bendigo and Lowburn/Pisa, are situated on either side of Lake Dunstan, an artificial body of water created in 1992 by the construction of the Clyde Dam. Bendigo on the east bank is the warmest area in Central – so warm it can grow Syrah successfully – but also makes some of the densest Pinots. The top wineries are Prophet’s Rock, Misha’s Vineyard and Quartz Reef. On the west side of the lake, Lowburn/Pisa is a large, mostly low-lying area that stretches for 25 kilometres. It is flanked by the Pisa mountain range to the west and some of its best sites are on slopes or rolling hills. The leading producers are Pisa Range, Surveyor Thomson, Burn Cottage and Pisa Moorings, but lots of wineries own vineyards or buy fruit from here. The boom in plantings, not to mention the proliferation of brands, reflects the success of Central. But rapid expansion has its downside too. It is expensive to grow grapes and make wine here, which is one reason why around 50 labels are produced by two large contract winemaking facilities, VinPro and the Central Otago Winemaking Company (COWCO), and a further 50 are vinified at other wineries. Of the 115 labels in the region, only 15 have their own wineries. Is there too much wine in Central? Or more specifically too much Pinot, since the heartbreak grape accounts for 70% of production? There are certainly some very good Rieslings (Mount Edward, Rippon, Carrick, Felton Road), Chardonnays (Chard Farm, Felton Road) and Pinot Gris (Misha’s Vineyard, Pergrine and Quartz Reef), but Pinot is what pays the bills. Or rather doesn’t, in some cases. “There’s quite a bit of oversupply,” says Steve Farquharson of Wooing Tree, “and a lot of wine ends up on the bulk market.” In that case, the sums don’t make sense, according to Nigel Greening of Felton Road. “You need to sell your wine at £15 or above retail in the UK, or you are doing so at a loss.” Farquharson reckons £20 is the break-even point. There are very few wineries with significant economies of scale in Central. The biggest are Chard Farm, Mount Difficulty, Akarua, Mud House, Peregrine, Amisfield, Carrick and Felton Road, but even they are small by international standards. There are a few boutique producers who sell their wines at high prices, but a growing number are struggling to find distribution. Who needs an unknown Central Pinot on a restaurant wine list at £60 when Burgundy sells better? The challenge for Central is to make world class wines, rather than good to very good ones. Of the 115 wineries in the region, I’d pick a dozen whose Pinots could go toe to toe with the best of the New and Old Worlds: Bald Hills, Burn Cottage, Chard Farm, Coal Pit, Doctors Flat, Felton Road, Gibbston Valley, Grasshopper Rock, Mount Difficulty, Mount Edward, Rippon and Valli. And yet too many Central Pinots seem over-priced in the international market, especially when set against generic and village level red Burgundies from 2009 and 2010. But maybe the comparison is unfair. Burgundy has had more than a century to master Pinot Noir, Central Otago a mere 25 years. As its vines get older and its winemakers more experienced, the most southerly wine region on the planet will continue to confound expectations. Leading wineries: Akarua, Amisfield, Bald Hills, Brennan, Burn Cottage, Carrick, Chard Farm, Charcoal Gully, Coal Pit, Desert Heart, Doctors Flat, Domain Road, Felton Road, Georgetown Vineyard, Gibbston Valley, Grasshopper Rock, Hawkshead, Judge Rock, Lowburn Ferry, Maude, Misha’s Vineyard, Mount Aspiring, Mount Difficulty, Mount Edward, Mount Rosa, Nevis Bluff, Northburn Station, Peregrine, Pisa Moorings, Pisa Range, Prophet’s Rock, Quartz Reef, Rippon, Rockburn, Sato, Surveyor Thomson, Terra Sancta, Three Miners, Two Paddocks, Valli, Wild Earth, Wild Irishman, Wooing Tree. No apologies for choosing six wines from the 2010 vintage, one of the most successful ever in Central, producing wines with impressive concentration. The most elegant of Blair Walter’s single vineyard releases, this biodynamic Pinot shows delightful freshness, structure and feline balance. Cherry and red fruits with a hint of spice, well integrated oak and bright minerality. Burgundian pale in colour and similarly fine and subtle on the palate, this sleek, beautifully defined Pinot is succulent and sweet, but with freshness and a stony, washed pebble minerality. Long and very fine. The densest, most complete Pinot yet from Phil Handford’s Alexandra property. Still young and concentrated, with red and black fruits on the palate, textured tannins, stylish oak and a fine, savoury finish. One of a series of stunning wines from Grant Taylor, this is as good as Gibbston gets: savoury whole bunch notes add some structure and perfume to the silky, sculpted fruit flavours. Scented, balanced and very long. Steve Davies is one of the best winemakers in Central, making organic Pinots of great complexity. This is rich and concentrated, with dark, smoky fruit flavours, plenty of stemmy whole bunch notes and a lingering, complex finish. This biodynamic producer benefits from the talents of US winemaker Ted Lemon as well as Kiwi Claire Mulholland. Spice and pepper on the nose and palate, with freshness underpinned by some savoury whole bunch tannins. Long and classy.